Social media platforms like Facebook and Twitter give brands the unique opportunity to be in constant contact with their audience, and research shows that more than 53% of customers now expect 24/7 reaction from their favourite brands. Some brands, for example Gymshark, have specific customer service ‘Help’ accounts separate from their main brand account that deal exclusively with customer enquiries. 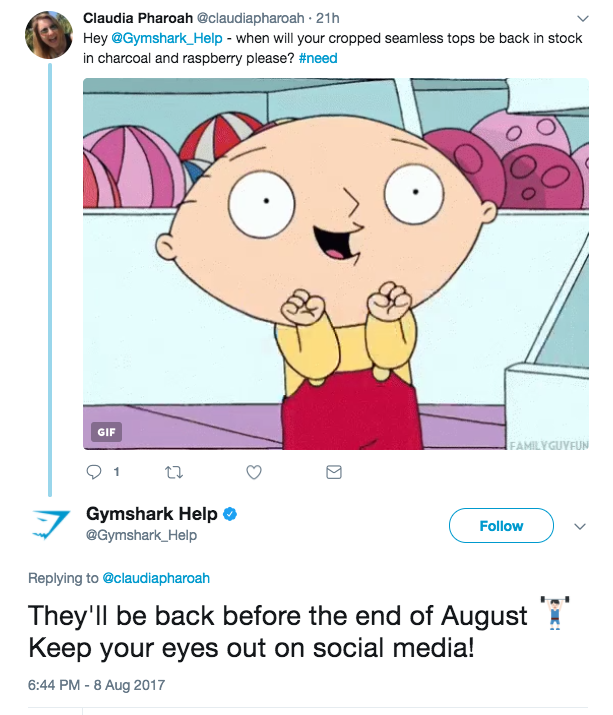 An excellent example of Customer Service ‘done right’, not only does the Gymshark help Account retweet their customers complimenting their customer service, they also post when specific products are back in stock, and thank customers for their patience when they are taking slightly longer than usual to respond to enquiries, explaining the reason why. Clearly swift customer service is valued by consumers and one of the worst things a brand can do is not reply to a message. But can your social media team always be available to reply instantly? Probably not. That’s why Facebook rolled out a new feature to page admins and editors called ‘Instant Reply.’ Just like automated ‘out of office’ email messaging, businesses can now set an automatic message to be sent out when they are unable to monitor their Facebook account. Not only is this a great way to offer an instant warm welcome to customers when they send a Facebook message, but it also provides them with an immediate reaction (if an automated one). When a customer contacts a brand via Facebook, they typically receive a delayed response. The ‘Instant Reply’ feature allows brands to set a fixed message that is automatically sent as a reply to all messages. This predetermined message can provide information on opening hours or perhaps a contact number or email address for urgent enquiries. This offers a more friendly customer experience and gives the impression that a brand really cares about it’s customers. Facebook also provides businesses with an option to send this automatic reply to messages received outside of their normal business hours – which would then be disabled during open hours. This feature can prevent any customers messages being ignored during the evenings and weekends when the business may be closed. 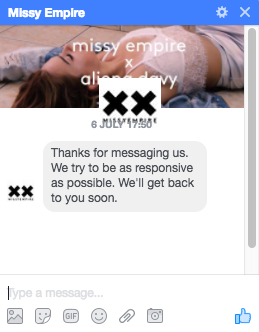 It takes 5 minutes to set-up but Facebook Instant Reply can make a big difference to your Customer Service. Need some more advice on managing your brands social media channels? Here at CuCo, our team have expertise in account handling for client’s social media accounts! Give us a call today on 01202 911959 or drop us a line at hello@cucocreative.co.uk – we’d love to chat about how we could help you and your brand succeed online!